The internet has changed the ways we connect and buy everything, and industrial buyers are no different. Industrial buyers want to work with the companies and people who are helpful first. For those in industrial and manufacturing industries being helpful often means adapting to the digital landscape. Earlier this year I partnered with Stream Creative to host an event tailored specifically to industrial manufacturers looking to succeed in today’s digital world. We set out to change attendees’ mindsets to better position their manufacturing business for success. With a heavy hitting lineup of speakers, we worked with attendees to create a custom marketing and sales playbook for their individual business. 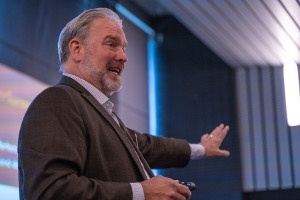 From leveraging LinkedIn to building an inbound framework for success, every speaker delivered practical action steps tailored to industrial manufacturers. The Industrial Inbound Summit might be over, but if you’re in the industrial manufacturing space our new podcast, The Industrial Executive might be for you. On the Industrial Executive podcast, I sit down each week with an industrial executive to talk about the challenges they’re facing, their triumphs, and what’s on their mind right now. You can check out the first three episodes now and subscribe on your favorite podcast platform to never miss an episode.